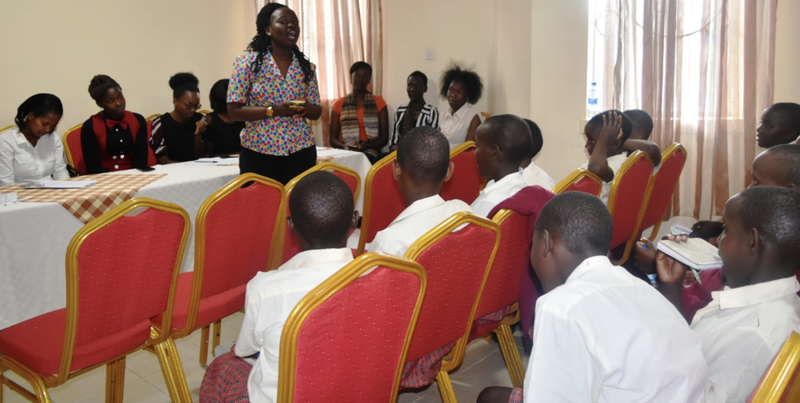 As part of our holistic approach that empowers girls both in and out of the classroom, our 8th graders took an educational field trip of our capital city, Nairobi. The first stop was the National Assembly where elected representatives from each county deliberate and resolve issues such as youth education. The 8th grade class stops for a photo in front of the Senate building, where representatives protect the interests of citizens by passing bills and writing laws . Many of our girls would like to return to this place some day to make transformative change for their own communities. This is the first time the girls have ever been in a skyscraper building -- just one of many opportunities Kakenya’s Dream provides to expose students to the world. The girls posed for a class photo from the top of the skyscraper with parents, staff, and teacher chaperones. Everyone enjoyed the view! Next stop at the airport! Many of our girls dream of becoming pilots, making this part of the field trip a highlight! Students took notes during the airport tour. Our future pilots want to remember what they learned! Our girls grew up near the Maasai Mara National Reserve that preserves savannah wildlife. Despite encountering animals in the wild on occasion, very few girls have ever learned about the amazing wildlife surrounding them. In Nairobi, they stopped by zoos and other centers dedicated to the study of Kenya’s natural wonders. A stop at the zoo allowed girls to safely observe and learn about the beautiful wildlife that is so close to home. Our future biologists enjoyed this stop! Smile, Felisters -- you’re on the air! The last stop of the tour at a news channel, exposing the girls to news and media production. Everyone got to take a turn reporting the weather! We have some future meteorologists on are hands at KCE - Mary is a natural! While in Nairobi, our 8th grade class also connected with some of the mentors from the Network for Excellence. The Mentors held a panel for the 8th Grade class. By connecting with the Mentors, the girls are able to identify their goals. After a full day of panels, rountables, and discussion, KCE students and their mentors pose for a picture. This year’s Nairobi trip was amazing. Our girls explored the city, connected with their mentors, and gained new skills to make their dreams a reality!